Check the programme of European Brewery Convention 2019 in Antwerp. The congress of the European Brewery Convention will take place in Antwerp in the period 2-6 June 2019. 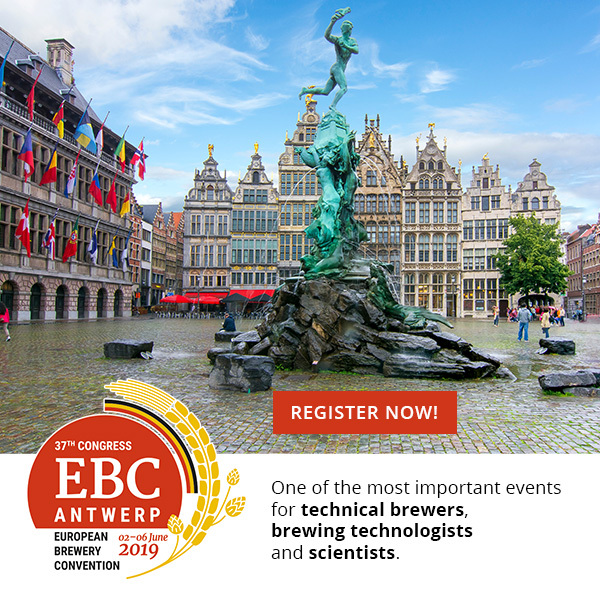 The EBC congress is one of the most important brewing technical events in Europe as well as across the globe. It appeals to researchers, technologists, scientists and other professionals involved in the fields of brewing, malting, beverage engineering and fermentation. The congress will be attended by about 500+ professionals. There will be more than 60 presentations. More than 120 technical posters have been accepted. Coffee / Tea, followed by joint BF / EBC plenary 11h00 – 12h30. 9139: Process innovation at Asahi Breweries – The pursuit of ultimate consistency of quality in Asahi Super Dry. Ito, et al., Asahi Breweries Ltd.
9144: First time quantification of cysteinylated aldehydes in malt and brewery samples. Trueba, et al., KUL / UGent / Wageningen Univ. Key-note and subsequent Panel Discussion. Best paper / best poster, etc. Award / logistical announcements farewell & techn.